I waited ages and ages to make these, partially because I’ve had so many good brownies made with cocoa that I find it difficult to buy unsweetened chocolate for brownie recipes. Luckily, I had some leftover from this cake + a dark chocolate bar from a friend. The time was ripe. Unfortunately, the while the original recipe touts these brownies as the ULTIMATE FUDGE brownie, I still thought they weren’t as good as some other brownies I’ve made. They were fudgy, but they weren’t as chocolatey as I would’ve liked. Just not ultimate enough to deserve the title. If you have some extra unsweetened chocolate lying around (because you can’t just eat that stuff for a snack), try these. Add in some Nutella swirl and sea salt or something. Jass et up. Note: If you’re going to make these for birthdays of pregnant women, don’t use booze as a flavoring. I did not cook the alcohol out of the frosting. Probably still not enough alcohol to do any damage, but we want to avoid another incident like this, so play it safe, guys. Play it safe. Unless you want to make this other boozy brownie I made once and forgot about: Kicky Fudge Brownies. All bets off. Preheat oven to 350°F. Grease an 8×8″ pan or line with parchment. Place butter, bittersweet chocolate, and unsweetened chocolate in aa microwave-safe glass measuring cup or bowl. Microwave in 30 second intervals, stirring after every interval until just melted and combined. Let cool slightly. Whisk sugar, eggs, salt, and booze in a medium bowl until light. Whisk in chocolate mixture until thick and glossy. Whisk flour and cocoa in small bowl, then stir into chocolate mixture until just combined. Pour into the prepared pan and bake until just set 20-25 minutes. Avoid overbaking for the fudgiest texture. Let cool completely in pan. 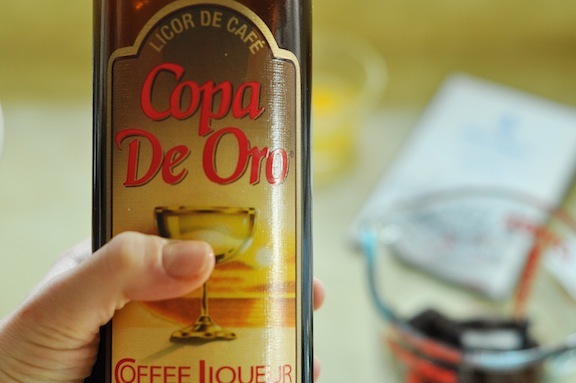 Mix approximately two tablespoons of Cafe D’Oro or Kahlua into a can of grocery store frosting (I used a whipped cream cheese frosting). Add more or less booze to taste. 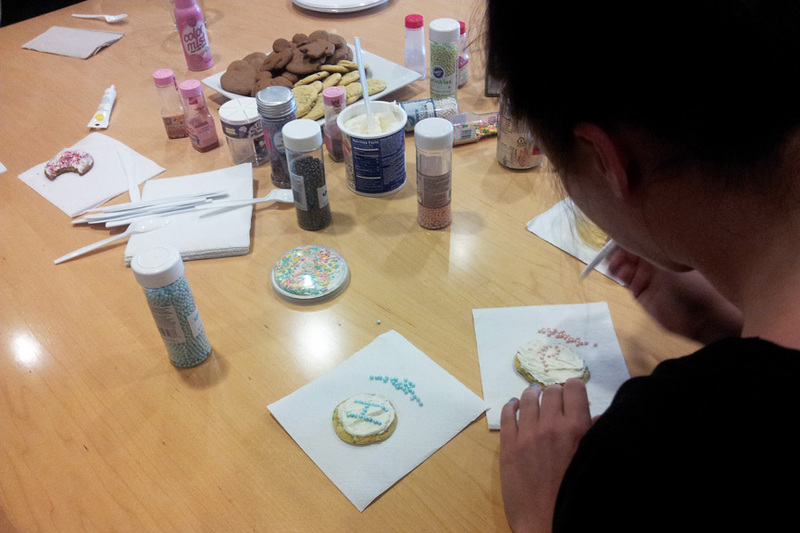 Spread over cooled brownies and decorate with sprinkles of choice. My friend got me this amazing cheater pan which encouraged my belief that I should never have to spend whole days making cinnamon rolls ever again. Why would I wait through two rises, when I can dump batter into a pan and pull these perfectly shaped buns out of the oven 45 minutes later? She wanted us to have a bake day to test this pan and like, spend time together, but I caved. The cinnamon roll pull was strong, and I am weak, and now you know that. So I betrayed my friend, going ahead and making this cake in this pan without her by my side. Don’t be like me. One consolation: this cake weren’t that great (like these pics, heavens). The recipe I adapted from included a heinous amount of butter and sugar (this is coming from me, so you know it is true). So I was determined to cut down on both (I added in some pumpkin to compensate for some of the butter reduction)…and I could tell. It just wasn’t sweet enough, moist enough or fluffy enough. Maybe I’m being critical, but seriously. It was so average. Unbelievably, both my dad and my sister’s boyfriend were like, going on about this cake when I saw them a week or two later. I was incredulous, but they insisted it was their favorite thing…and they eat a lot of things that I make. So I just don’t understand, but we’ll just add that to the list and not mind it anymore because it’s a low-priority thing to understand. Unlike how it was ever decided that harem pants were a cool thing. That is important to understand. Societal change must occur. I’ll make a better cake in this pan with my friend and redeem myself in multiple ways next week. 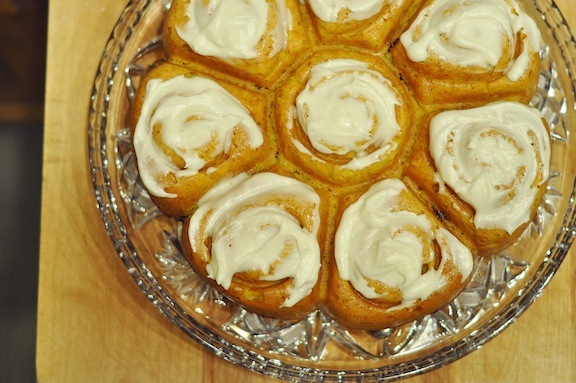 Grease a Bundt, 9×13 or cinnamon roll pull apart pan lightly with butter. Sift together the flour, salt, sugar and baking powder in a large bowl. Whisk together the milk, eggs, pumpkin, melted butter and vanilla in a medium bowl. 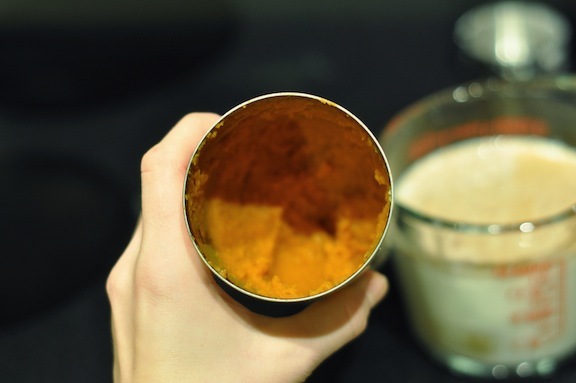 Stir the wet ingredients into the dry ingredients until blended, but don’t overmix. Pour batter into the greased baking pan. For the topping, mix the softened butter, brown sugar, flour, cinnamon and pecans until well combined. Drop evenly over cake batter by spoonfuls and use a knife to swirl the topping through the cake. Bake at 350 degrees for 25-30 minutes or until toothpick comes out clean from center. Turn the cake out onto a serving platter. For the glaze, mix the butter, powdered sugar and maple syrup. Add milk, one teaspoon at a time, until the glaze reaches a spreading consistency. Schmear on a slightly cooled cake, and serve warm or at room temperature. These are nearly the same as the whole wheat cinnamon buns I tried once. They rely on a biscuit dough instead of a yeast dough as a base, so the prep time is drastically shorter. Granted, the end result is not a yeast bread like a traditional cinnamon roll, but that is hardly a concern if you’re pressed for time and craving butter and cinnamon rolled up in a little cakey bundle. 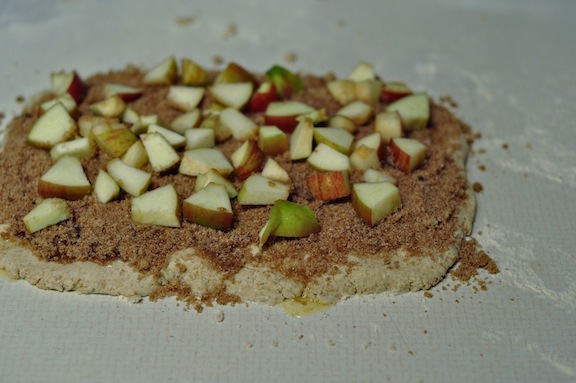 Since I opted to swap out the whole wheat flour for regular, I added apples, you know, for health reasons. 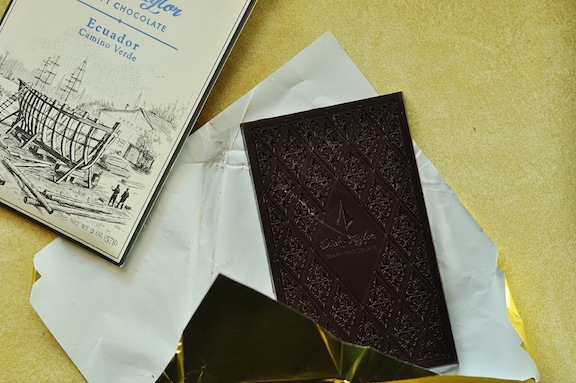 Or, if we’re indulging in a bit of baker nerdery–Madagascar Bourbon Vanilla or Tahitian Vanilla Bean, etc. Look at the spillage happening here. 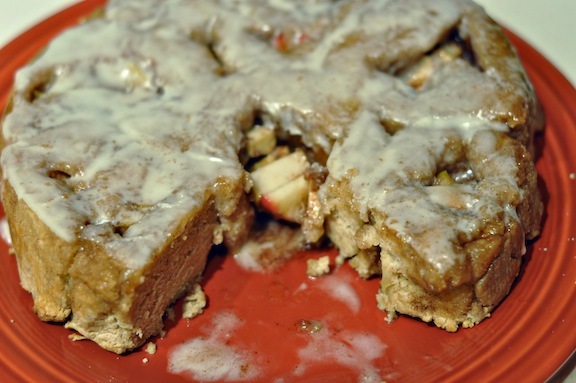 A veritable gold mine of apple chunk. I hope you’ve enjoyed this history lesson. If not, I have high hopes that you’ll enjoy these cinnamon buns along with your French Vanilla instant cappuccino. Melted butter is used in both the filling and the dough and to grease the pan. Melt the total amount (8 tablespoons) at once, and measure it out as you need it. Adjust oven rack to upper-middle position and heat oven to 425 degrees. Pour one tablespoon melted butter into 9-inch nonstick cake pan; brush to coat pan. To make the filling, combine sugars, spices, and salt in small bowl. Add one tablespoon melted butter and stir with fork or fingers until mixture resembles wet sand; set filling mixture aside. Chop apples into small-ish chunks. I chose to leave the skin on, but you can peel them if you feel like it. To make the biscuit dough, whisk flour, sugar, baking powder, baking soda, and salt in large bowl. Whisk buttermilk and 2 tablespoons melted butter in measuring cup or small bowl. Add liquid to dry ingredients and stir until liquid is absorbed (dough will look very shaggy), about 30 seconds. Transfer dough to a well-floured work surface and knead until just smooth and no longer shaggy. Pat dough with hands into 12 by 9-inch rectangle. Brush dough with 2 tablespoons melted butter. Sprinkle evenly with filling, leaving 1/2-inch border of plain dough around edges. Press filling firmly into dough. Using bench scraper or metal spatula, loosen dough from work surface. Starting at long side, roll dough, pressing lightly, to form tight log. Pinch seam to seal. Roll log seam-side down and cut evenly into eight pieces. With hand, slightly flatten each piece of dough to seal open edges and keep filling in place. Place one roll in center of prepared nonstick pan, then place remaining seven rolls around perimeter of pan. Brush with 2 tablespoons remaining melted butter. Bake until edges are golden brown, 23 to 25 minutes. Use a spatula to loosen buns from pan. Invert buns onto a plate or wire rack. Cool about 5 minutes before icing. Stir butter, powdered sugar milk in large nonreactive bowl until a smooth glaze forms, about 30 seconds. Spoon glaze evenly over buns; serve immediately. The buns are best eaten warm, but they hold up reasonably well for up to 2 hours. And then I realized, beautifully: I don’t have to wait until Thanksgiving to eat this. Eating sweet potato casserole does not have to be limited to large family gatherings filled with traditional foods. It can be like, a normal food that I make myself and reheat for lunch. It has sweet potatoes in it, heaven knows. So I set out to create a fairly simple recipe that I could throw together on a Sunday night. Sweet potatoes, eggs, spices, not too hard. I intended to make a sweet potato casserole. 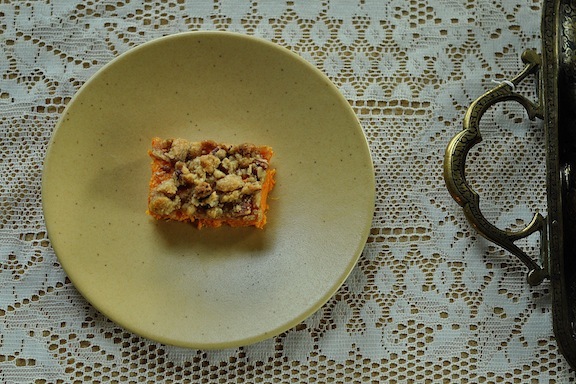 What I actually made was a sliceable sweet potato bar with pecan streusel topping (read: YUM CROSSWAYS). Next time, I’m going to leave out the eggs in the hopes that the texture will be more scoopable, less sliceable. Also, I will take more time to make sure the potatoes are really soft, so I don’t get chunks. Score one for impatience. Here’s the thing. I can’t tell if this casserole/bar is a dessert recipe or just a normal side dish recipe. It’s definitely got less sugar/butter/marshmallows than some desserts, but it isn’t just, like, boiled sweet potatoes. Maybe that is the beauty of holiday foods: no one can really tell if they’re eating healthy or not, but it is ok not to care for a day. The desserts can masquerade as sides and no one rings the alarm. There is protein in chocolate cake, there is calcium in cream cheese frosting, and there is Vitamin A in this sweet potato bar. Some nutrition gets through. I think. P.S. Updated the recipes page of the blog–should be a little bit easier to navigate now. Enjoy the archives. Chop the peeled potatoes into large chunks and microwave in batches until tender. I had to do three batches in a Pyrex measuring cup covered with a paper towel for about five minutes. It would probably be better for you to bake or boil the potatoes to ensure they are quite soft–my casserole had chunks. Place potatoes in the bowl or a standing mixer fitted with the paddle attachment. Add maple syrup, milk, 3 tablespoons melted butter, 1/2 teaspoon salt, spices and vanilla. Beat at medium speed until smooth. Add eggs; beat well. Pour potato mixture into a 13 x 9–inch baking pan coated with cooking spray and spread evenly. Combine flour, sugar and chilled butter in a medium bowl, cutting in the butter with two knives until crumbly. Cut in the pecans, and give the streusel a few good stirs until evenly combined. Sprinkle on top of the potato mixture. 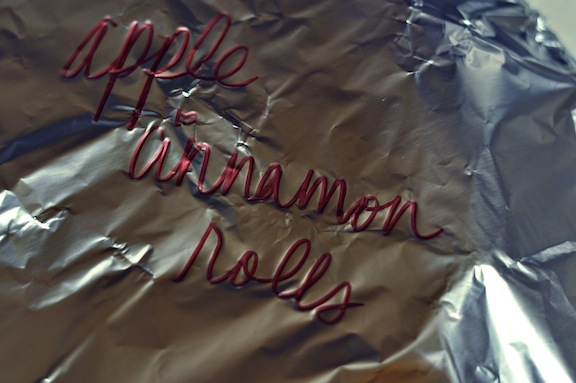 Cover the pan with foil. Bake at 350 for 15 minutes. Uncover the pan and bake another 15 minutes or until the topping is browned. I found these unusuals in a bar with odd drinks. No filter. This month, it was my turn to pick a holiday, and can you guess what I chose? 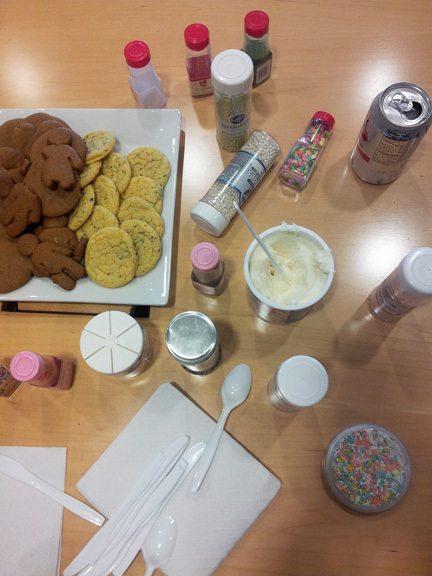 Sprinkles Appreciation Day, babyyyyy. Because who can say they don’t like funfetti things. No one. It’s too sparkly happy pink to be hated. It is called FUNfetti. But actual true life, I don’t even like sprinkles, and I will brush off as many as possible. They’re crunchy and annoying and tasteless and detract from my cake experience. Frosting from a can. I’m not above it. These cookies weren’t quite as good as the other cake batter cookies I made once, but they are soooo easy. And very happy sparkly. 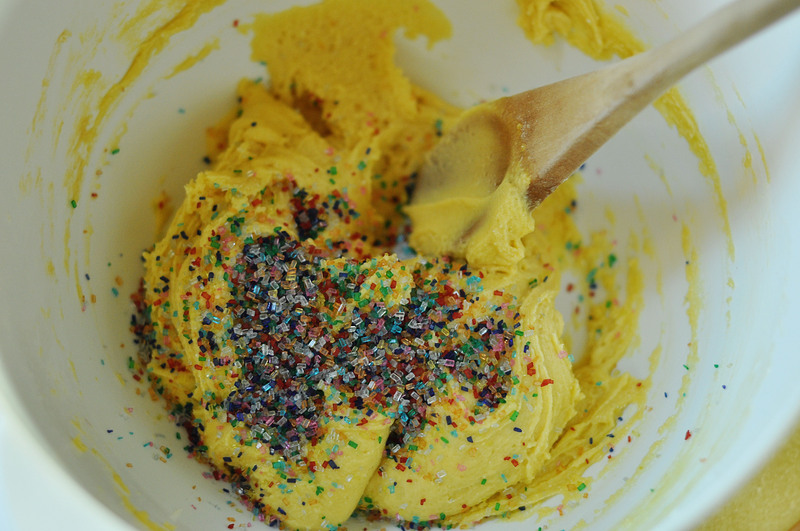 Mix together all ingredients except the sprinkles until well combined, then gently stir in the sprinkles. 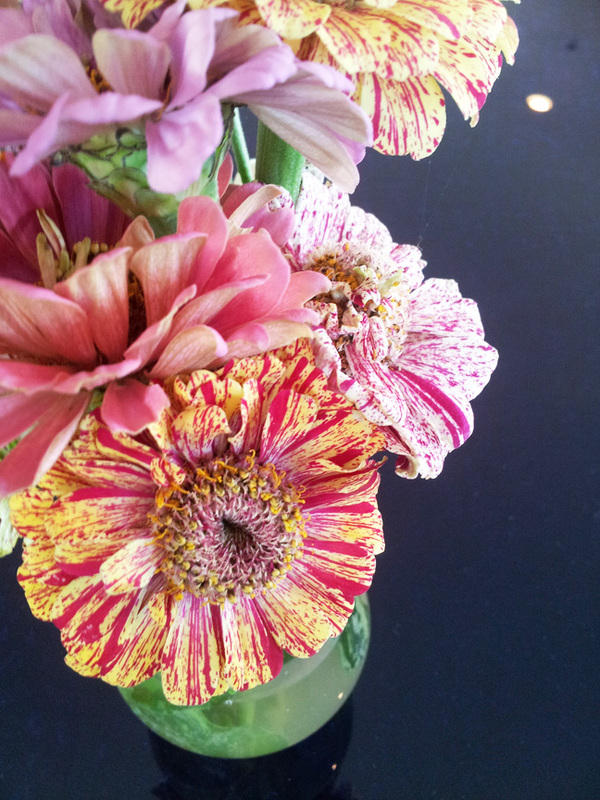 Don’t overmix them, or the colors will run together. 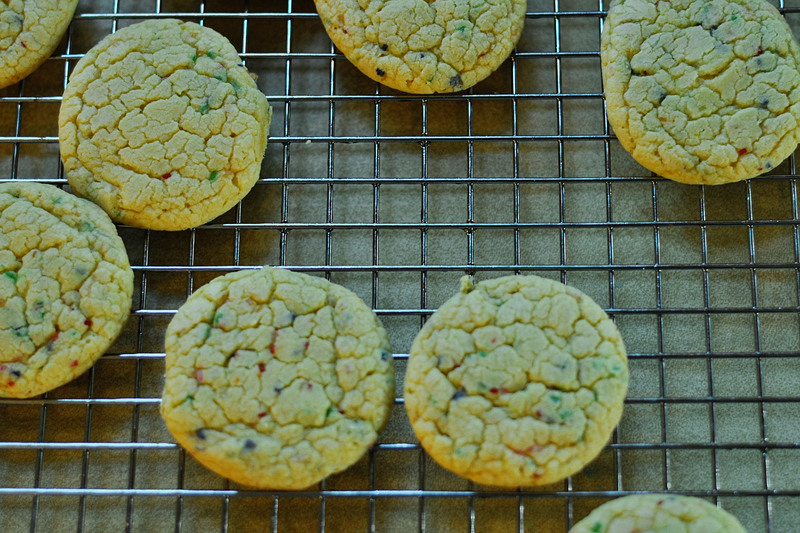 Drop by rounded tablespoons onto a baking sheet, leaving an inch or two between the cookies. Bake for 8-10 minutes until just set. Remove to a wire rack to cool. Store in an airtight container. Here is a little burst of blueberry for your day. These are healthy breakfast muffins, perfect for popping out of the freezer, zapping in the microwave and shoving in your pocket to eat on the morning commute. Or, you know, fresh from the oven on a weekend morning slathered with butter. Either way, they are a welcome addition to my life, especially gearing up for the busy holiday season. Never hurts to have a little health and a quick snack tucked away for the times when you’re running every which way. These are a one-bowl affair, working equally well with out-of-season grocery store blueberries or flash-frozen sale blueberries. I chose the latter. Hate to burst your blueberry bubble, all you Violet Beauregarde wannabes, but berries are not in season right now. We are not in the season of them. I’m buying nothing but citrus and pomegranates right now. P.S. This is my 300th pipe dream, and I didn’t even do anything special for it. I will sometime. Do something special, I mean. Preheat the oven to 375 degrees. Line a muffin tin with six liners , or grease six muffin tin cups with oil. 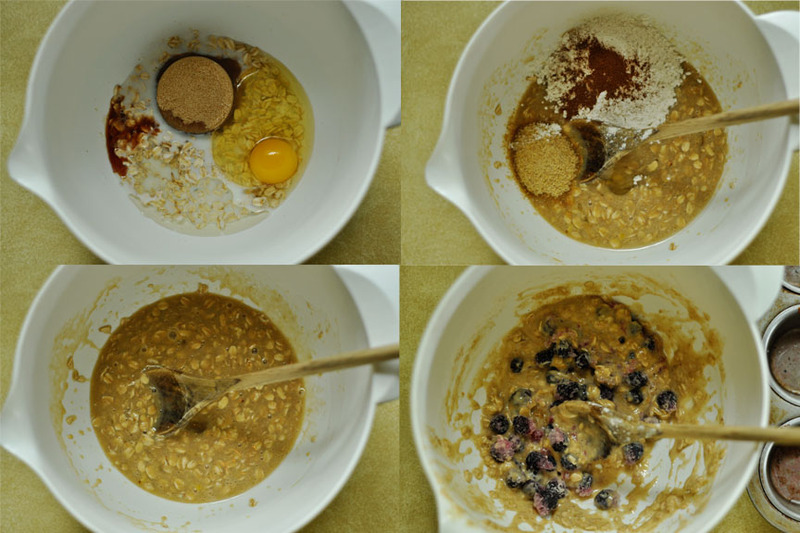 Combine the oats and buttermilk in a mixing bowl. Let the oats soak for 10 minutes, then add the melted butter, egg, brown sugar, and vanilla. Stir until just combined. Add the flour, flax, baking powder, baking soda, and salt. Stir again until evenly moistened. 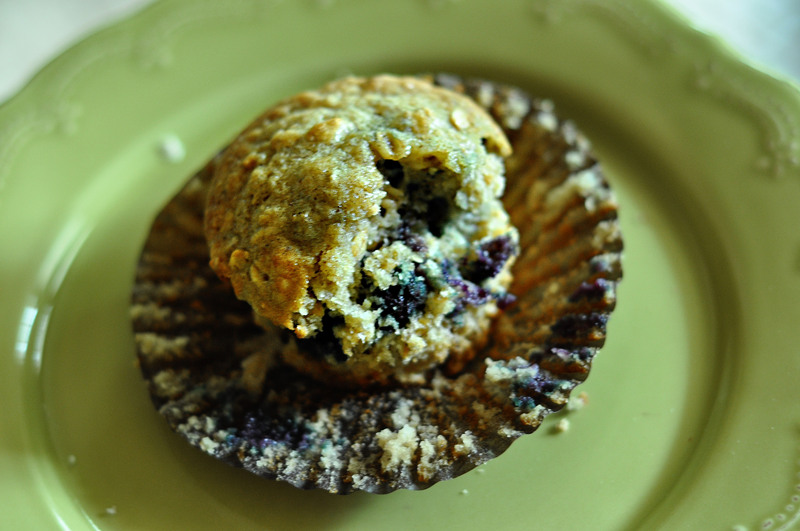 Before adding the blueberries, scoop a spoonful of batter into each muffin tin, using about half the batter. 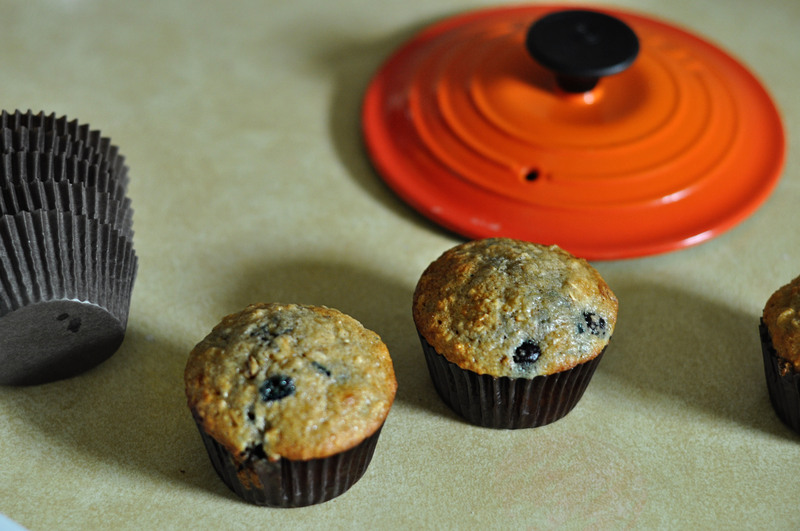 Gently fold the blueberries into the remaining batter and divide evenly between the muffin tins. Bake muffins for 13-15 minutes, or until golden brown.